What schools did you consider for after Hesston? Or did you always know you were going to Wichita State? Before finally choosing Hesston, I was really close to choosing WSU. However, the feeling of community and the personal touch that Hesston offered led me to start here first. All through my two years at Hesston, the plan was to go to WSU after. In what ways did Hesston prepare you well for transfer? My Hesston Experience allowed me to feel comfortable as I transferred into a larger community. What I loved about Hesston was the personal relationships that I got to create with my professors. These relationships nurtured my desire to push myself to continue to get better in my classes and other interests. When I transferred, I went in with the expectation that I would build relationships with my professors in a very similar fashion. That push for personal relationships at WSU continued to nurture my desire to learn and grow. Secondly, you can’t come to Hesston and not be involved with the campus community. You get to meet a lot of different people from many different backgrounds, which I believe prepared me for becoming a part of the larger WSU community. Connecting and being engaged with many different people was not a new concept for me. What were your favorite parts of your Hesston Experience? My favorite part of the Hesston Experience was the relationships both with other students and with the faculty and staff. As I have continued to grow and learn in life, it has been clear that relationships are at the heart of everything we do. Community is an important part of being successful and happy in life (in whatever way being successful and happy looks and feels to you). What were your favorite parts of your Wichita State experience? I enjoyed the community and relationships that I was able to create at WSU. While I had to work harder to find the community, it was very much there and ready to be engaged with. Whether it was playing noon hour basketball with a group of guys that became great friends, friends made during 242 (a Bible study group), meeting great people in my wife’s sorority, or time spent with my professors and fellow students in the Social Work department, there were many great opportunities to be in community. Are you glad you went to Hesston and went State? Why? I am very glad that I chose to start at Hesston and then go to WSU. 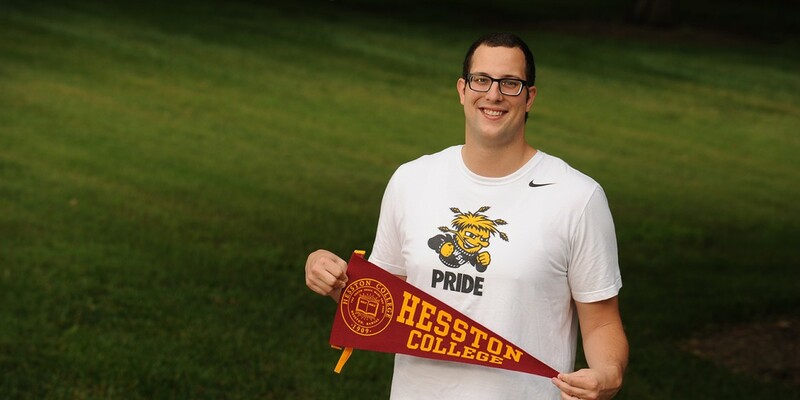 I believe that the commitment that Hesston has to fostering student learning and intellectual growth, along with a HUGE commitment to a nurturing and supportive community allowed me some opportunities I may not have received in my first two years if I just chose WSU. There were times where I was asked a question, or told a story, or given an opportunity that truly stretched me and helped me begin to grow into the person I am today. WSU is just so large that I’m not sure I would have had many of those same experiences had I started there. I have both a bachelor’s degree and master’s degree in social work from Wichita State. What did you do after finishing your degrees? My appreciation for the experiences that Hesston gave me really pushed me to want to come back and work here. After graduating with my master’s in social work I came back to work at Hesston as a resident director. I found that many of the principles that I learned in my degree were things that could translate well in that position. Plus, it allowed me to continue to foster the great community that makes Hesston such a special place to so many students. I now work in Hesston’s Admissions Office and get to help other students make the great decision to start here. What would you tell high school students considering starting at Hesston and transferring to Wichita State or any state school? The experience at Hesston is one that builds such a strong foundation academically, professionally, socially and spiritually as you move into the next steps in life. Truly life changing opportunities don’t present themselves all the time, however I think that Hesston College is one of those opportunities. I believe that because of my own experience and the countless others that I have heard, witnessed and been a part of during my time as a student and employee.